Just as I walked back behind the curtain with the camera, Mandy was just handed her newborn son. She regarded him for the first time, just seconds later she kissed him for another first. We were fortunate that I had the camera ready for each precious moment in time. 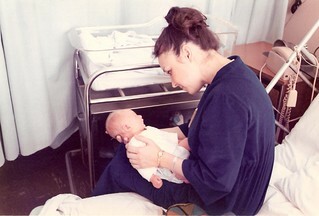 The nurse had just brought him from cleaning and weighing him after his birth a few minutes before.